Stephen King famously likened his writing to the “literary equivalent of a Big Mac and fries.” A Big Mac and fries leaves you feeling lethargic. Calm and content, but soon after mildly depressed and vaguely sick. I can’t imagine any reader feels lethargic, calm, and content after reading It. The book is definitely satisfying, but I’m usually left feeling more tense than calm. Now past the halfway mark in his epic tome It, I can see where King would draw the comparison, but perhaps not for reasons that are immediately obvious. The obvious parallels would be accessibility and affordability. Whether you travel to Germany, Australia, Japan, Sweden, Spain, Russia, France, Israel, Serbia, The Netherlands, Brazil, or Finland you can find a McDonald’s. And there, too, you will find a copy of It. Both are (or even certainly more so in the late-80s) instantly recognizable American icons. Either can be found in the most convenient locations. But while one has become the ultimate metaphor for mass consumption and social complacency, the other is revealing of the dark and terrifying side of those social trappings. King’s Big Mac and fries is actually a Happy Meal and the prize is, well, your worst nightmare! In Part 4 this week, King uses one of his most popular devices; de-romanticizing the American Dream. We go back to July of 1958, the summer the Losers Club became whole with the addition of their seventh member. The final piece to complete this puzzle is Mike Hanlon – our tour guide in Derry’s past, present, and future via the Derry Interlude chapters – in a flashback that exposes the biggest blemish on America’s white picket fence dream; racism. Mike is chased to the other six – Big Bill, Ben, Eddie, Richie, Stan, and Bev – by a group of older bullies whose ignorant leader Henry Bowers is the most feared of them all. This particular incident comes after a series of heinous crimes against the Hanlons, Derry’s only black family. King loves to revel in the hypocrisy of the American dream and does so with reckless abandon in the opening of this book. He forces his reader to consider the underside of America’s great quilt of diversity and the real life monsters lurking there. He makes prejudice a personal story, first in the opening with a hate crime against a gay couple and again with Stan’s wife Patricia. King can be both subtle and overt in his commentary on the result of hate and ignorance. For this part which features more of Mike’s back story, he takes the power of ignorance to a terrifying level. We shift between the supernatural monster and the real life human predator. Both are equally terrifying, but unfortunately the latter is one that doesn’t vanish when you close the book. Mike is in good hands with the Losers Club though. Each member is an outcast and they are all excluded from polite society for different reasons. Bill stutters, Stan is a Jew, Ben is fat, Richie can’t keep his mouth shut, Eddie is a weak mamma’s boy, and Bev is poor and socially awkward because of her overbearing father. Finally, there is Mike Hanlon, the only black kid in Derry. To their peers they are lame duck losers, but together they find that each member possesses an exceptional quality and by joining forces they just might be the saving grace of Derry for future generations. When King refered to his writing as a Big Mac and fries I’m sure he was talking about the power of his brand, but you could draw a less obvious connection to the ubiquitous fast food chain. More people than not have a taste for Micky D’s and I think almost anyone will be able to relate to the tale King presents in It. Sure, there are plenty of people who would never eat at a fast food joint and certainly people who aren’t King fans. But more often than not the fast food chain is able to draw in crowds with a waft from their grease soaked kitchen. Likewise, King brings millions of readers, many of which aren’t typically fans of speculative fiction, who want to be scared and know they will connect to his story. It sounds dismissive to compare a master like King to an evil corporate empire like McDonald’s, but it’s really a compliment to the power and universality of his words. Of course, it’s important to note that his words won’t clog your arteries or give you an addiction to sweet tea! Before I wrap up the first edition of Bit by Bloody Bit with the final chapter of It by Stephen King, I want to take a look at all the incarnations of his monster on book covers across the globe. So, come back next week and check it out! 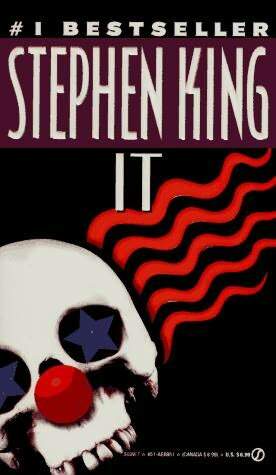 This entry was posted in Novels, Reviews and tagged Bit by Bloody Bit, IT, Stephen King by Meli Yoroshiku. Bookmark the permalink.